Field Day 2018 was a success for LARC, the ARRL, and the community thanks to our club members! A special thanks to club member Steve Piotrowski, AG2AA, offering club members the real field experience at his own QTH. 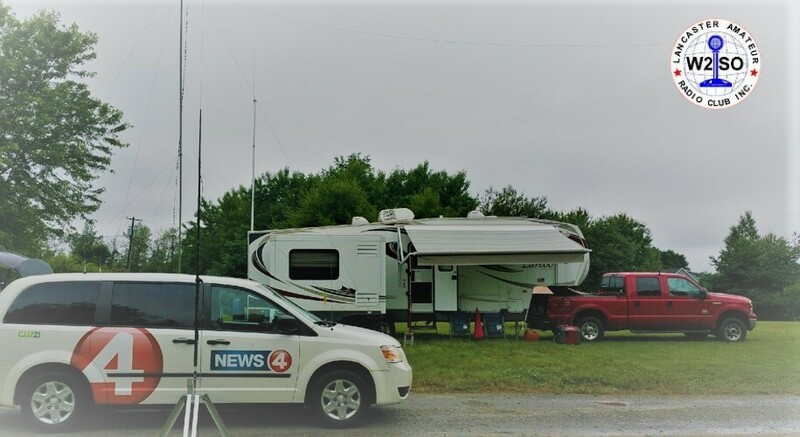 Buffalo’s own WIVB News 4 interviewed our club during Field Day to help raise awareness of Amateur Radio and the contributions we make. Click to read more and watch the interview. Throughout the month of June, Lancaster Amateur Radio Club President Joe Gearhart (WV2NY) began drumming up club members to become Radio Active. Through the efforts of club volunteers – we did ! There is no better way to summarize the essence of ARRL’s Field Day, but for those who have not had the opportunity to visit a Field Day site, they may miss out on the importance of this event. The ARRL, the Amateur Radio Relay League, sponsors and promotes this annual, national event. Lancaster Amateur Radio Club members, friends and family alike use their skills in operating radio equipment not only for leisure, but in support of community events such as the American Diabetes Association’s Tour de Cure and Buffalo’s own Roswell Park’s Ride for Roswell, one of the largest single-day bicycle fundraisers in the nation. Skilled operators contribute 365 days a year through programs such as the Armed Forces’ MARS and the National Traffic System, sending health and welfare messages worldwide in support of those affected by strife or disaster. Buffalo’s WIVB News visited the Lancaster Amateur Radio Club this year to put a spotlight on LARC’s contribution to ARRL’s field day. A copy of the broadcast is included below, courtesy WIVB.